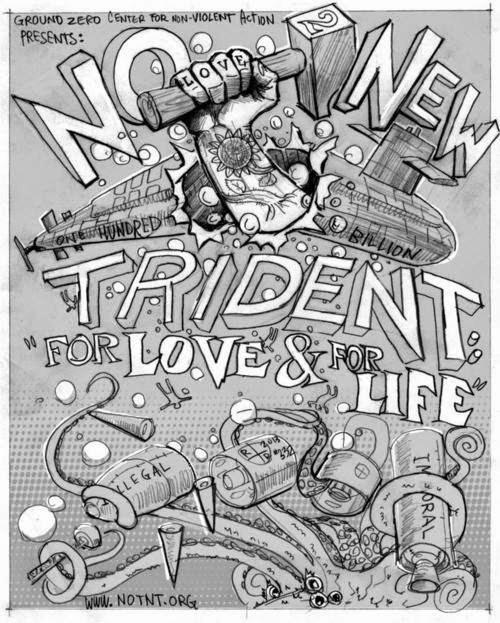 NO To NEW TRIDENT - For LOVE & For LIFE: What Have Nuclear Weapons Done for ME Lately? Isn't that an excellent (and seldom-asked question)! Well, they certainly have NOT deterred North Korea's esteemed Kim Jong un from trying some very unusual hair styles. But seriously - It is time to shatter the illusion of the safety of nuclear weapons... that they are a deterrent in a post Cold War world. Trident is the epitome of that Cold War mentality - a first strike weapon system that was intended to up the ante in the balance of terror with the (then) Soviet Union. But I digress. Today is a great day for the NO To NEW TRIDENT Campaign. No - The Navy hasn't yet scuttled its plans to build 12 new Trident submarines. But we'll keep working on that! Today we are celebrating the unveiling of the official NO To NEW TRIDENT Campaign poster created by that Tacomic genius, R.R. Anderson. With an extraordinary understanding of Trident and our campaign's mission, he whipped up this bit of artwork just for us. I don't think anyone will mistaken this for anyone else's campaign; that's for sure! The Tacomic in association with the Ground Zero Center for Nonviolent Action urges you to somehow Stop the Navy from building twelve new Trident submarines (at a cost of at least $100 billion). "Although we want to stop this stupid submarine project, we are doing it to seek positive goals - spending that money on life-affirming things and moving towards a nuclear weapons-free world." So now it's full steam ahead toward a nuclear weapons-free world, starting with Trident. Join us! Editor's Note: Also check out the Tacoma Action Figure: Father Bill "Bix" Bichsel, REAL ULTIMATE American Hero at R.R. Anderson's Website, along with the Plowshares Sunflower Seed Bombs.